Can be used with socks, stockings and knee-highes. The two long loop handles are perfect for people with limited hand function, back problems, wheelchair users or people recovering from hip or knee surgery. The flexible plastic core is lined with blue nylon to reduce friction. The outside is covered with terrycloth to prevent the sock from slipping. Plastic core has a one year guarantee. Hand washable. Place the sock over the stocking aid. 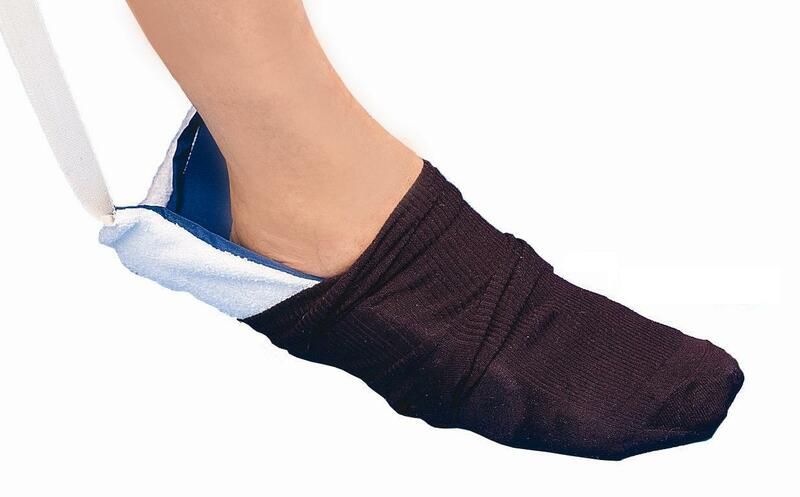 You hold the pulling straps and put the front part of your foot into the sock. With help of the pulling straps you can remove the stocking aid from the sock.